Beidh traenáil peile eadroma agus cruinniú againn ar an Luan 03/11/14 i ndiaidh am scoile, 2.30-3.30. Fifth and sixth class boys football training. We will have a light training session and meeting this Monday 03/11/14 after school from 2.30-3.30pm. Múinteoirí Siobhán Ní Núnáin agus Aodán. 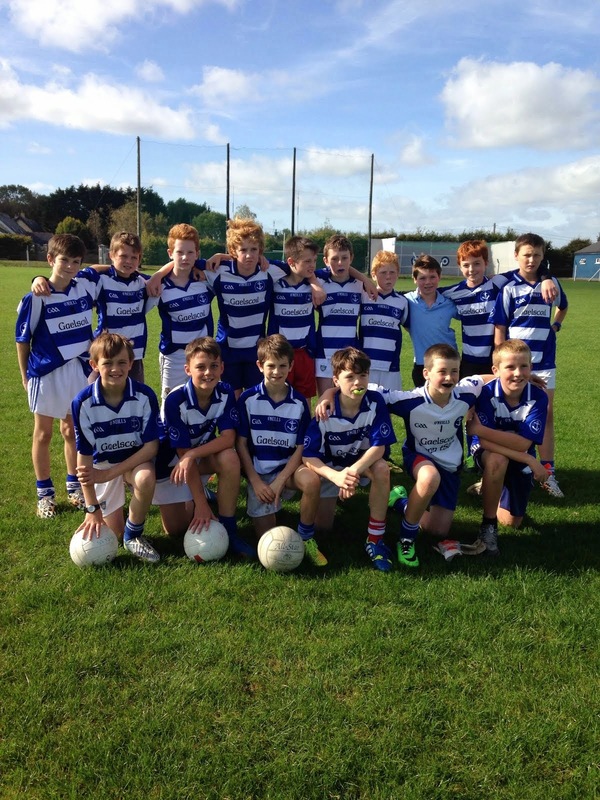 The Sciath na Scol boys football final will take place Wednesday 05/11/14 @ 12.00 in Páirc Uí Rinn against Timoleague. Beidh níos mó eolas ag teacht maidir le taillí/ tacaíocht/ cláir srl. go luath. More information will be made available shortly in relation to entry fees/support/match programmes etc. Lá spórt againn amárach an Déardaoin. (23.10.2014) in ionad an Aoine. Caithfidh na páistí a néadaí spóirt a chaitheamh. We will have PE classes tomorrow, Thursday (23.10.2014) instead of Friday. All pupils should wear their sports clothes. Meabhrúchán do thuismitheoirí Ranganna 5 agus 6; Beidh cruinniú faoin cóineartú sa Friary amárach Dé Céadaoin an 22/10/14 ar a 7.30in. A reminder for parents of children in Fifth and Sixth Classes; There will be a meeting about the confirmation in the Friary tomorrow, Wednesday 22/10/14 at 7.30pm. Tá comórtas MINI SEVENS cailíní R5 R6 Sciath na Scol peil gaelacha ar an nDéardaoin 23/10/14. Beidh seachtar gcailíní ag imirt le triúr ionadaithe. Tá sé ar siúl i Passage ag a 10.30 má tá an aimsir go maith. Beidh carr nó dhó ag teastáil chun na cailíní a thabhairt ann. Teir i dteagmháil le Hilda. There is a MINI SEVENS girls football competition Sciath na Scol this Thursday 23/10/14. Seven 5th and 6th class girls will line out, with three subs. The team has been selected and named. It is on in Passage at 10.30 am, weather permitting. We will need a car or two to bring players to and from Passage. Contact Hilda if you can drive. Comhghairdeas agus céad mile buíochas le Nessa Ní Mhaoileoin agus Eva Ní Chrualaíoch. Ghlac said páirt in Oíche Chultúrtha Cionn tSáile le déanaí (M.F. 2014) ar son na scoile. Sheinn Nessa an cello is sheinn Eva an piano. Bhí an-oíche acusan agus ag an lucht féachana i Séipéil Naomh Multose. Maith sibh cailíní! A big congratulations and and a sincere thank you to Nessa Ní Mhaoileoin and Eva Ní Chrualaíoch who recently ( Sept.2014) represented the school at Kinsale Culture Night. Nessa played the cello and Eva played the piano. Both played exquisitely and their pieces were thoroughly enjoyed by all on the night. Well Done girls! An tseachtain seo ( 20-24 Deireadh Fómhair 2014) tá Seachtain na Frithbhulaíochta againn sa Ghaelscoil. Tá an-obair / taighde déanta ag an fhoireann le cúpla mí anuas ar pholasaí ina leith a chur le chéile. Tá sé anois ar shuíomh idirlíone na scoile agus faofaithe ag an mBord Bainistíochta. Léigh tríd an pholasaí agus plé sa bhaile é le do pháiste. Tá Córas Dea hIompair / cártaí bána srl leis againn sa scoil agus beidh sé ag rith taobh leis an bpolaisí Frith Bhulaíochta. Beidh ranganna / obair bhaile bunaithe ar bhulaíocht ag do pháiste an tseachtain seo. Beidh gach pháiste sa scoil ag fáil budaí agus beidh ciorcal cairde a thosnú againn sa chlós. Ciorcal é seo inar sheasann páistí nach bhfuil ag imirt l'éinne agus nuair a fheiceann a chairde iad téann siad chucu chun imirt / labhairt leo. 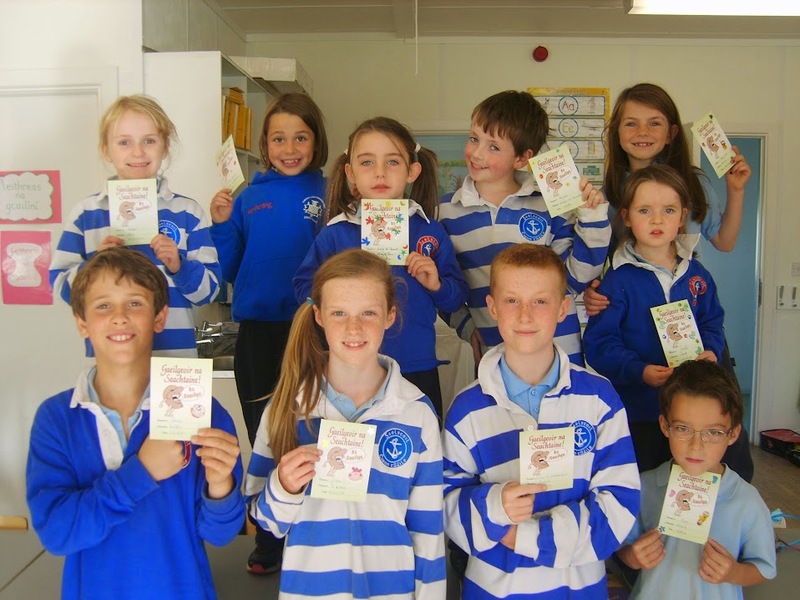 This week (20-24 October 2014) is Ant-Bullying Week in the Gaelscoil. The staff have done great work / research over the last few months on putting this anti-bullying policy together. It is now on the school website and ratified by our Board of Management.Please read through the policy and discuss it at home with your child. Our Policy of Good Behaviour (white cards system) in the school and it will be running alongside the new Anti-Bullying policy. Your child will have classes / homework based on the topic of bullying this week. Every child in the school will be getting a buddy and we will be starting a friendship circle in the yard. This is a circle in which children stand if they have no one to play with and when their friends see them in the circle they go to play / talk to them. Comhghairdeachs le múinteoirí na scoile a chur béim mhór ar Seachtain na Matamaitice an tseachtain seo chaite (13-17 Deireadh Fómhair 2014). Bhí sé go hiontach na páistí a fheiscint gníomach timpeall na scoile / sa chlós i mbun triailacha matamaitice. Maith sibh! Tá samplaí don dea-obair a bhí ar siúl le feiscint ar fallaí an phasáiste. Congratulations to the teachers of the school that put a big emphasis on Maths Week last week (13-17 October 2014). It was wonderful to see the children active conducting maths trials around the school grounds. Well done!. Examples of the good work carried out are on show in the school. Tá briseadh mean téarma ag druidim chugainn go tapaidh agus beidh an scoil dúnta an seachtain seo chugainn. Tá sé de nós againn sa scoil cead a thabhairt dos na páistí teacht ar scoil ina n-éadaí oíche shamhna ar an Aoine agus beidh am spraoi acu i rith an lae san chomh maith. I mbliana táim ag iarraidh ar na páistí a thagann ar scoil gléasta suas €2 a bhreith leo. Beidh an tairgead á bhailíodh á chaitheamh ar scéim leabhair a dheighleáileann le toipicí mothalacha. Tá stór bheag againn faoi láthair agus tá tuismitheoirí ana bhuíoch astu in am a gháthar. Táid bunaithe ar téamaí cosúil le páistí faoi bhrú, le scarúint tuismitheoirí, bás sa chlann srl. Mura bhfuil siad feiscithe agat tá an t-adh leat ach táid anseo má tharlaíonn droch heachtra i do shaol/saol do pháiste. Éinne a thagann ar scoil gléasta suas cuirfear a n-ainm i gcrannchur le haghaidh na puimcíní móra maisithe atá lasmuigh d'oifig Hilde! Críochnóidh na páistí ag na gnáthamanna 1.30 agus 2.30 ar an Aoine seo (24-10-2013). Ní bheidh leath lá ann toisc gur saoire leath-théarma é seo agus ní deireadh-théarma ar nós um Nollaig, um Cháisc agus laethanta saoire an tSamhraidh. The mid term break is fast approaching and the school will be closed next week. As with every year we will let the children come to school on the last day in their Halloween costumes and they will have some fun that day in school as well. I'm asking the children that dress up to bring in €2. Every child that arrives dressed up will get a raffle ticket for a chance to win one of the large carved pumkins that are on display in the school. The children will finish at the normal time of 1.30 and 2.30 on Friday 24th Oct 2013. 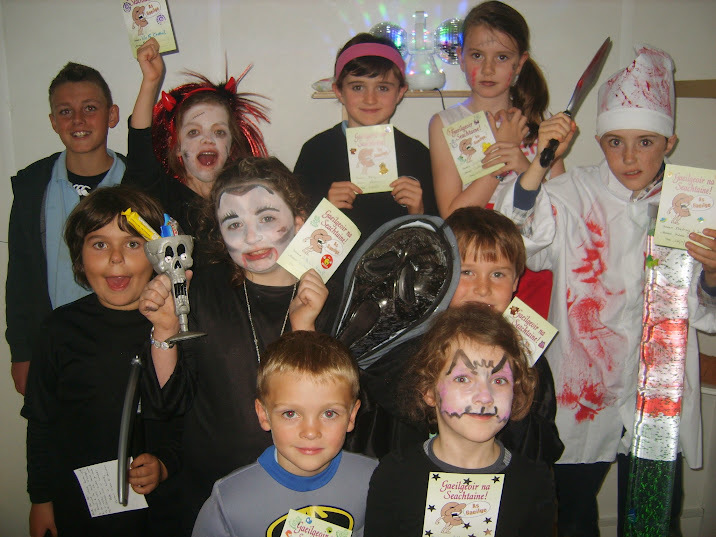 The money collected will be spent on a book scheme that deals with sensitive topics. We have a small stock of these books at the moment the parents are very grateful for them during a time of trouble. The books are based on a variety of themes like children under stress, parental separation, death in the family etc. These books are here for you to borrow if you need them. Tá 5th and 6th class boys' football final Sciath na Scol will take place during the first fortnight after Mid term break (4-14/11/14.) We will hopefully have more information before this Friday (24/11/14). Gheobhaidh páistí ranganna a 3 agus a 4 foirm iarratais ar an 17/10/14 má tá suim acu a bheith ina bhfreastalaithe altóra. Is féidir libh na foirmeacha líonta a thabhairt go Hilda roimh an 23/10/14 agus tabharfaidh sí chuig Oifig an Pharóiste iad. Pupils in 3rd and 4th class will receive an application form for altar servers on the 17/10/14. Completed forms can be handed back to Hilda before the 23/10/14 who will pass them on to the Parish office. Bhí an bua ag foireann buachaillí na scoile! Tá siad sa chluiche cheannnais anois. Comhghairdeas mór leo go léir! Beidh an chluiche cheannais ar siúl an tseachtain seo chugainn i bPáirc Uí Rinn. The school's boys football team won in the semi final today (16/10/2014). They are now in the final which will be held in Páirc Uí Rinn next week. The following are suggestions that you might like to take into account before the next 'Do this in Memory' Mass of your child's preparation for First Holy Communion which is this Saturday 18th of October 2014 at 6.30pm in the Parish Church. Encourage your child to read pages 40 and 41 of the Thumb Book and to do some colouring. Pray and do the actions of the Sign of the Cross. Priest: The Lord be with you. Response: And also with your Spirit. At the end of the readings, response: Thanks be to God. It would be good to arrive 10 minutes before Mass starts and to sit up towards the front of the Church and to bring the Thumb Book. Táimid ag dul tríd cúntaisí na scoile faoi láithir. Tá go leoir airgead le teacht isteach fós ag tuismitheoirí. Seans go bhfuil dearmad déanta ag daoine futhu. Ní maith liom brú a chur ar dhaoine ach tá an scoil féin faoi bhrú ó thaobh airgid de. Muna bhfuil tú cinnte faoi bheith i bhfiacha leis an scoil cur glaoch ar Hilda. Oibríonn Hilda gach lá go dtí 1.30p.m. Beidh sí in ann a rá leat. Má tá deachrachtaí ag daoine ní bheidh aon fhadhb le córas íocaíochta míosúla a thosnú go deireadh na bliana. Níl le déanamh ach labhairt le Hilda. Beidh na socraithe seo faoi rún an scoil agus na daoine aonair. We are going over the school accounts at the moment. There is a lot of money due from parents. It is possible that people have forgotten. I don't like to put pressure on people but the school itself is under financial pressure. If you are not sure about owing money to the school, give Hilda a ring. Hilda works every day until 1.30 p.m. She will be able to tell you. If people have difficulties there will be no problem setting up a monthly payment plan to the end of the year. All you have to do is to speak to Hilda. These arrangements will be confidential between the school and the individuals involved. Seo iad a leanas na buachaillí a bheidh ag glacadh páirt i gcomórtas scileanna peil gaelacha i gCarraig Uí Laighin ar an 15/10/14 ag a 4.00. The following are the names of the boys who will be participating in the football skills competition on the 15/10/14 at 4pm in Carrigaline. Comhghairdeas libh... agus go n-éirí libh! Tá an scoil ag glacadh páirt i Seachtain na Matamaitice na hÉireann 2014! Beimíd ag déanamh gníomhaíochtaí éagsula gach lá an tseachtain seo chun suim sa mhata a spreagadh i ngach páiste. Beidh ranganna áirithe ag déanamh tóir mata timpeall clós na scoile. Beidh ranganna eile ag imirt cluichí ar líne, ag úsáid fearas mata go gníomhach agus ag déanamh meastacháin, ag tomhas agus ag imscrúdú. Tá áiseanna ar fail ar an suíomh idirlíon do thuismitheoirí chomh maith. 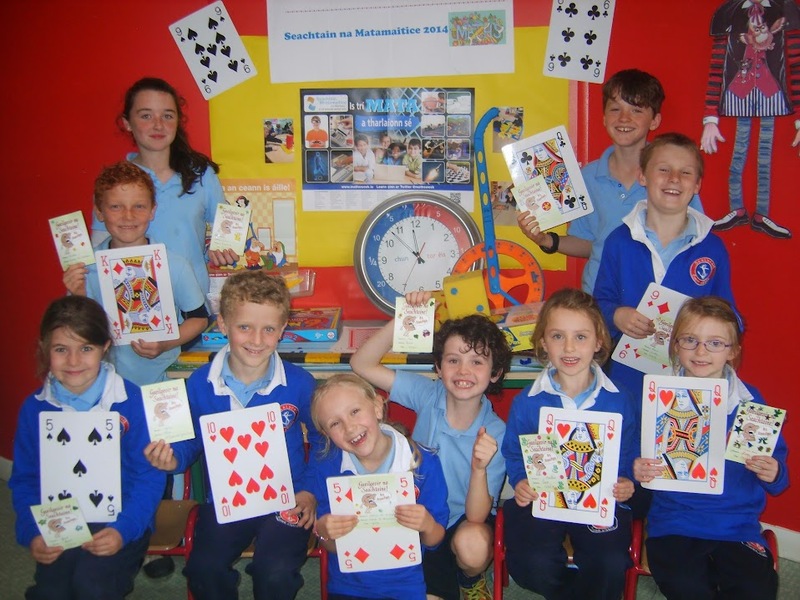 The school is participating in Maths Week 2014! Pupils will participate in extra mathematical activities all week. Some classes will do a maths trails around the schoolyard. Others will play interactive games on school laptops and use concrete materials to predict, measure, count and investigate. We always integrate active learning into our maths classes, but we will do so even more this week! Save the date! Parents of junior and Senior Infants, 1st, 2nd, 3rd and 4th class. Suim airgid faighte i gclós na scoile an tseachtain seo. Má tá seans ann gur leatsa é cuir glaoch ar an oifig. A sum of money was found in the school yard this week (week commencing 6/10/2014). If you think it is yours please contact the school office. Idirlín na Scoile as órd de bharr an stoirm. Dein cumarsáid linn trí Hilda san oifig. The school internet is down because of the storm. You can contact us via Hilda in the office. 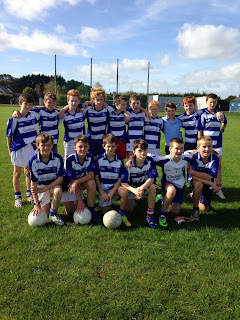 Tá an cluiche Sciath na Scol a bhí le bheith ar siúl ar an 10/10/14 (Aoine) curtha ar aghaidh chuig an 09/10/14 (Déardaoin). Tá sé ar siúl i Moneygourney i gcoinne St. Patricks Rochestown ag a 2.20. Beidh orainn an scoil a fhágaint ag a 1.00. Ní bheimid ar ais go dtí thart ar a 4.00. Tá blitz MINI SEVENS ar siúl ar an 10/10/14 (Aoine) i Ballygarvan ag a 10.30. Beimid ag fágaint na scoile ag a 09.15. Níl cead ach 10 mbuachaill a bheith ar an bpainéal de réir na rialacha. Beimíd ag ainmniú an phainéal amárach 08/10/14. Má bhuann na buachaillí, rachaidh siad ar aghaidh chuig cluiche cheannais, agus má bhuann siad é sin, roghnaíonn siad BUACHAILL AMHÁIN ón bhfoireann chun imirt i leath am i bPáirc an Chrócaigh do chluiche ceannais na hÉireann 2015. Tá trialacha scileanna ar siúl ar an 15/10/14 i gCarraig Uí Laighin ag a 4.00. Beidh deis ag triúr buachaill ó Rang a 6 chun páirt a ghlacadh. Déanfaimíd trialacha ar scoil ar an Aoine beag seo le Anthony má táimíd ar ais in am ó Ballygarvan. Muna bhfuilimid, déanfaimíd ar an Luan 13/10/14 chun an triúr buachaill a roghnú. le bhur dtola, teir i dteagmháil le Hilda má tá sibh tiomáint chuig Moneygourney nó Ballygarvan. The Sciath na Scol football game (5th and 6th boys and girls) that was arranged for the 10/10/14 (Friday) is now on the 09/10/14 (Thursday.) It is on in Moneygourney against St. Patricks Rochestown at 2.20pm. We will leave the school at 1.00pm. We will be back at approx. 4.00pm. There is a MINI SEVENS blitz on the 10/10/14 (Friday) in Ballygarvan at 10.30 am. We will be leaving the school at 9.15am. There can only be 10 BOYS on the panel, according to the rules. We will name the panel on the 08/10/14. The winning team will go through a process and eventually ONE player will be selected to play half time in Croke Park on an All Ireland day 2015. There is a skills competition on the 15/10/14 in Carrigaline at 4pm. Three 6th class BOYS will attend from the school. We will select these boys by holding our own trials- either this Friday 10/10/14 if we are back on time after the blitz, or Monday 13/10/14. Please, if you are willing to drive to either Ballygarvan or Moneygourney, please contact Hilda ASAP. Ag féachaint ar uimhireacha don scoil bhliain 2015/2016 tá cine tógtha ag an mBord Bainistíochta go mbeidh ranganna 2 agus 3 ag teacht le chéile. Sé sin go mbeidh sraith amháin do ranganna a trí agus ceathair againn. Gan amhras is ar an teolas atá againn faoi láthair a bhraitheann sé seo agus lé cúnamh Dé ní thiocfaidh athrú ar an scéal. Looking at our figures for the 2015/2016 school year the Board of Management have taken the decision to join the currently split 2nd and 3rd classes. We are hoping to have one third and one fourth class next year. These plans are based on our current knowledge of figures and, therefore , could change. We would like to advise you that the Scoil Mhuire Entrance Assessment Exam will take place on Saturday 18th October 2014, from 9.15 a.m. to 12.30 p.m., the cost of which is €50. This fee can be paid online for pupils who have been awarded a place in 1st Year 2015. If a pupil wishes to sit the scholarship Exam, she must sit the Assessment Exam first, as those who are invited to sit the Scholarship Exam are chosen from the 12 top achieving results in the Assessment Exam. The Scholarship Exam will take place on Wednesday 19th November 2014. We would appreciate it greatly if you would inform any interested pupils of the dates of these exams. Cluiche amárach 02/10/14 ag a 12.30 i bpáirc CLG Chionn tSáile. Táimíd ag fagaint na scoile ag a 11.45, ag siúl ann. Beimíd ar ais ar scoil ag a 2.20, ag siúl ann. Bí cinnte go bhfuil cosaint fiacla ag do pháiste. Match tomorrow, 02/10/14 at 12.30 at Kinsale GAA pitch. We are leaving school at 11.45, walking to the pitch. We will be back at school at 2.20, having walked back. Please ensure your child brings their gum shield.